Linz, 29 March 2017: Now it is official. Linz Center of Mechatronics GmbH (LCM) has made it into the TOP 5 of the Hermes Award. In addition to submissions from Finland, Germany and Switzerland, LCM’s project “Digital twin of a fully automated bending machine” together with Salvagnini Maschinenbau GmbH was able to convince the independent jury chaired by Prof. Dr. Dr. h. c. mult. Wolfgang Wahlster, Chairman of the Board of the German Research Center for Artificial Intelligence (DFKI) and member of the Nobel Prize Academy. 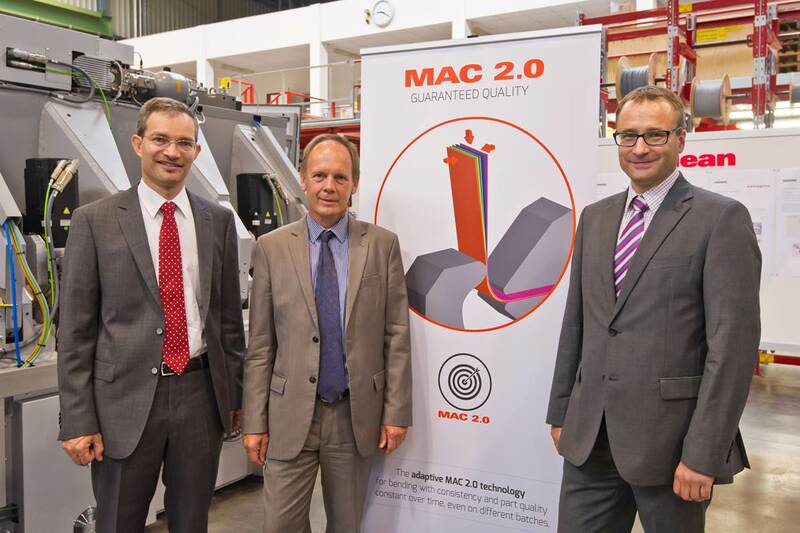 In cooperation between Linz Center of Mechatronics GmbH (LCM) and Salvagnini Maschinenbau GmbH, the new LEAN PANEL BENDER generation from Salvagnini was developed in the spirit of industry 4.0. LCM has completely virtualized the design and production process, whereby all relevant physical parameters are automatically taken into account. The digital twin developed by LCM features automatic material recognition MAC 2.0 (Material Attitude Correction). LCM’s Smart Automation team has used numerous computer simulations and real-life measurements to determine the laws of mechanical properties in bending processes with a wide variety of sheet metals. These were mapped in a complex simulation model and then integrated into efficient software that controls the bending process in such a way that optimum product quality is always achieved – regardless of the number of pieces, sheet thickness or material quality. Sensors on the drives of the automatic bending machine measure the process parameters within milliseconds and thus determine the material properties. This means that an end point of the tool path matched to the material is already calculated at the beginning of the bending process. The new automatic bending machines enable both batch sizes of 1 and large series to be produced without rejects – and this with maximum production quality and maximum energy and resource efficiency combined with minimum set-up and cycle times. The Hermes Award, considered to be the world’s most important industry prize, is presented annually at the opening ceremony of the Hannover Messe Industrie. Products that stand for technological innovation are honored. “Whoever is nominated for the HERMES AWARD is already one of the winners and receives maximum attention. This year, for the first time, three international companies are among the nominees, which proves the high significance of the HERMES AWARD as an innovation prize at the world’s most important industrial trade fair,” says Dr. Jochen Köckler, Member of the Board of Management of Deutsche Messe AG. PS: LCM was already nominated once in 2012 for the Hermes Award. More information can be found here.